I am grateful for my lack of furry critters making use of my garden as their market. We have rabbits and deer in our neighborhood, but they haven’t found my garden to be worth the fence-hop. As for the community gardens, I can only assume they don’t like the busy roads on two sides. 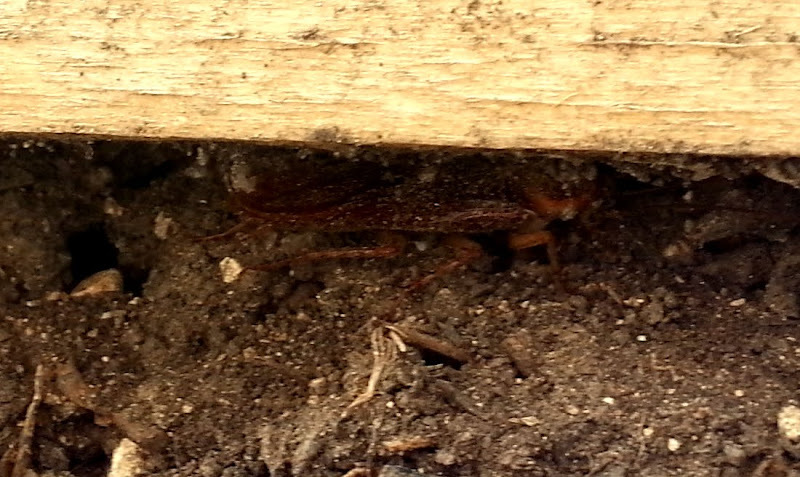 I do get quite the surprise sometimes when it comes to the crawly critters. Awhile back, it was the caterpillar bigger than my middle finger. This time, it’s a few things. Like this thing. A cicada shell. They’re currently peppering tree branches and leaf piles throughout the neighborhood. 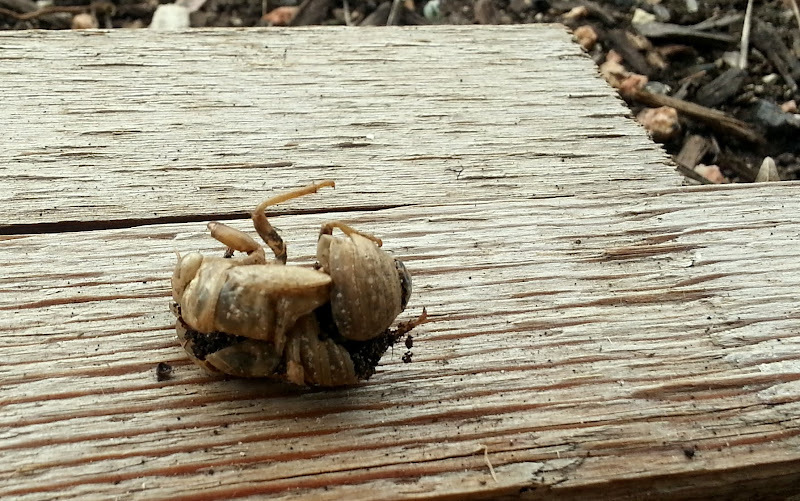 I found this shell when chasing down a tree roach that leapt from the earth I was digging, just fast enough to make me jump before I saw what it was, and race off. I’m not sure of their actual name, but imagine a cockroach, that gets about three inches long, and FLIES. Then imagine it hosts a demeanor of an attack missile. Sometimes when you come upon one and startle it, it will actually run away. Other times, it will come AT you. It’ll get stuck in your hair, hang onto your shirt, and otherwise make you dance around hitting yourself like a maniac only to leave you with the creepy-crawlies for the rest of the day. Not familiar with a tree roach? This was the best photo I could snag of the fellow. Or, for easier viewing, I found a funny post by another Texas-transplant here – with much better visual aids. And then there’s the Case of the Creepy Sweet Potato. Fiber issues? Drought issues? Bug issues? What’s your guess? We’ll finish this Creature Feature with a wonderfully ancient-looking caterpillar. It reminds me of both The Neverending Story, Chinese dragons, and Alice in Wonderland. Have you guessed yet? It’s the happy-looking Giant Swallowtail Caterpillar. I put him back on the potted orange tree where I’d found him. DH says he’ll be evicted if he takes more than his fair share. I went to check on him a few days later to discover that he had a new little friend of the same kind, and he himself had more than doubled in size. In my brief reading to research this caterpillar, it became obvious that they like citrus trees. Why he and his brother selected the orange over the lime, I couldn’t say. Mimosas over margaritas, perhaps?